I have to say I am addicted ..it was fun, could be quick (if I only had a moment to myself!) and relatively easy. No priming, No sanding, No problems. I bought my bedroom set 23 yrs ago but could only afford the sleigh bed and a small dresser at the time and never got around to night stands. By the time I could afford it they were long gone. These tables were from our girls bedroom. They were my daughters Great grandmothers. I had painting them white years ago with latex paint ..Not so good! Then I heard of chalk paint. I know I am pretty late to the game with Annie Sloan Chalk Paints but, if you are too, you need to check out Deneen from Dreaming in Color. 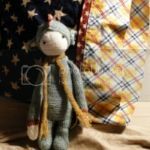 She is a fellow Jersey girl who has this amazing blog filled with all her creations and furniture pieces. This new obsession is all her fault now ;-), as I just ordered three more paint colors and now have multiple pieces lined up to transform. I used Paris Grey as the base color and with the Clear Wax then a subtle hint of the Dark Wax and then finally gold leaf. The possibilities are endless. You can layer the paints, distress, add gilding waxes. You can go with a heavily distressed look or smooth plaster look. I went with very little distressing here and the French Gilding Wax in Kings Gold cause I am from Jersey after all and I do like my glitz! I think they blend nicely with my bed and the hint dark wax really brings it all together. I am going to paint the inside of the drawers in Versailles. Next on the block is my girl's bathroom vanity. This was actually my first project but Paris Grey wasn't the right color. I will be using Scandinavian Pink with Old Ochre over top and lightly distressed. i got all my supplies from Classic Wall Finishes. I highly recommend Classic Wall Finishes. They are quick with shipping , great prices and extremely helpful. Patty, called me when I placed my first order and spent about 40 minutes on the phone with me walking me through different techniques. She was fabulous. I am looking forward to taking one of her workshops one day. Luckily she is only about an hour or so away from me. I strongly suggest if you are looking to paint some furniture to try Annie Sloan paints. I hope you all have a great holiday weekend. We are taking a few days off and are going to fit in some day trips before school starts.I apologize for not having a recipe for you today...I am having the cooking blahs at the moment.Well at least today that is! I am also repainting my bedroom in the next few weeks too... A little bedroom makeover is in order, it's been 13 yrs with the wall colors! Well, it's winding down, summer that is but life is going to be full force once again. I was starting to feel a bit anxious...you see I am the mother that doesn't like to see the kids go back to school, well when they are little that is teens need to be in school 24/7 365!!! . They are only little for such a short time and I have enjoyed and cherished watching my little guy playing Legos all day or at the beach or getting ice cream at our favorite ice cream stand. I have loved hearing him in his bedroom using his imagination and acting out the stories boards he created in his mind. We had some great conversations and great downtime...It was a good summer for us! My little guy wasn't feeling well so we stayed close to home. It was a good thing I was able to work on creating a new baby booty pattern and picked up "way to long on the needles" knitting projects. I really want to finish these for my KAL/CAL. I am also working on spending less time at the grocery store. I did a run down on what I spent in food this summer and it was a bit high OBNOXIOUS!! So I went to the fridge and used what I had in there for tonight's dinner. Penne pasta with pan seared tomatoes and prosciutto. Simple easy quick and it did the trick. My garden is producing a lot of the cherry tomatoes at the moment so this was perfect. This could very easily be meatless and add some radicchio would be good I think. Cook pasta according to package (make sure to add a good amount of salt to the water, this flavors the pasta) save some pasta water. Heat olive oil in a saute pan till hot. Add onion & prosciutto let it get crisp but not burn. Now add the tomatoes, heat is still pretty high at this point but again you don't want it to burn. When the skins start to split on the tomatoes start to crush them. Now add the reserved pasta water and let it all blend to make a nice sauce. Once blended cut the heat and add the half and half. Drain the pasta and add directly into the saute pan. Turn the heat back on medium add a tablespoon of butter and give it all a good stir and let the sauce gloss the pasta. Last add the grated cheese and serve at once. I am also cherishing my pretty summer flowers and butterflies! We really needed a weekend to just breath and take in some sights. I walked around my yard on Saturday and got some great shots. I do love this season of butterflies and hummingbirds. I tried this new recipe from Martha Stewart's Everday Food. We all loved it. But, don't mix in the Ricotta cheese just add dollops of it, I mixed it in while the pasta was hot and I think I drowned out some of the flavor. Super easy and quick. i also tired baking with Coconut palm sugar ( it is supposed to be a healthier sugar alternative) not a fan for baking with it. It made my Banana muffins a bit spongey. If you get a chance I highly recommend the NYC High Line Park. It was just gorgeous and a really cool perspective of the city. Beautiful gardens, great food carts and my favorite people watching! How about that mural of the famous WWII photo. My favorite photo I think is of the red door by the fire escape. I don't know why it just spoke to me. We had our youngest with us so we had to dangle a carrot in front of him to get him to walk almost the whole city with us! So of course we ended up at the Lego store in Rockefeller Plaza. Yes, some one was in heaven! As he fell asleep last night he looked at me with eyes half closed and asked me "what are we going to do tomorrow?" I said "just staying home and resting" he replies " I think I'm just going to build a lot of Legos tomorrow" and with that he passed out! Pretty good way to fall asleep don't you think? We took the ferry from Liberty State Park in Nj (another great view of the city too). It was amazing to visually see and imagine at the same time how much the water rose during Hurricane Sandy last summer. You could still see some of the effects in Jersey City. Well, its back to work today. I have a lot of projects to get going on and I have been working hard on this project for the My Sisters Knitter KAL/CAL. I'm eager to get onto my next finishing project and of course I got another crocheting inspiration last night. Like I need another one!!! I adore Hugh Jackman and his coffee "Laughing Man Coffee"... can he get any more wonderful! check it out!